The script lasts around 25 minutes, and tells the traditional bible based nativity story (via Grandpas bedtime story), using narration and lots of small speaking parts (all in rhyme) and the novelty of Herod as a pantomime style villain. This nativity play is set in an excited children’s bedroom on Christmas Eve, when Grandpa settles the children to sleep by reading the traditional nativity to them as a bedtime story. With the exception of the introductions that Grandpa reads for each scene, it is written entirely in rhyme, including the narration, and the 22 (some optional) speaking parts. Uses short, rhyming speaking parts (averaging 2 to 4 lines) to make everyone feel special. Whilst flexible and adaptable for ANY SIZE CAST (smallest reported to date is 9, and the largest 150), the script is written with 22 speaking parts and…. Is all held together with a rhyming narration. If you’re ready to buy the GRANDPAS NATIVITY STORY, click on the ADD TO CART button below, or continue reading if you need more details. ‌Click here to see a script preview to show how flexible and adaptable this script is. 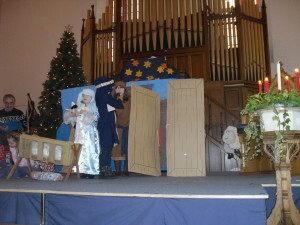 ideally, the play is performed with one stage area for the child’s bedroom where Grandpa is based to read the story, and another stage area for the nativity story to be acted out. Grandpa Joe (good reader) with 9 rhyming lines when interacting with the children, plus 14 individual paragraphs throughout the play to read from the script (disguised as a book) as an introduction to each nativity scene. n.b each of the characters in italics are deliberately written as optional parts and can be omitted or lines spoken by the narrator so that the script is not reduced. Finally, my own (optional) catchy “Ho Ho Ho” (Santa’s Song) is also included together with alternative variations referring to St Nicholas, and/or Rudolf the Red Nosed Reindeer. You may choose to use the play with no reference to Santa/St Nicholas/ the reindeer etc & it will be just as effective. If you choose to include the “The Grandpa’s Nativity Roll Call Poem” allow up to 2 minutes, but recognise that this poem is different in length dependant on how many of your cast stand and say their line and how speedily and efficiently they do so! The poem gives everyone in the cast the opportunity to bow and respond at the relevant point. If you choose to use the poem “The Ultimate Christmas Gift” to round off the play allow another 2 minutes, again dependant on how you choose to use/ perform it and what stresses and pauses you include. If the script is used exactly as written, no individual has a large amount to learn (I aim to give everyone just a couple of rhyming lines each, and Grandpa reads his words from a script disguised as a book). With the exception of the excited children in the bedroom, Grandpa and the narrator(s), the characters tend to be in their own individual scenes, making it easy for scenes to practised individually without the need for full rehearsals. 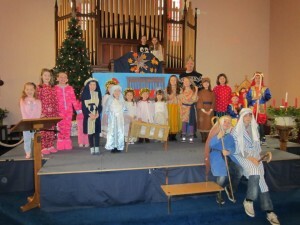 5 children (in pyjamas/dressing gowns), roman soldier, Mary, Joseph, innkeepers 1, 2 and 3 and 4, Shepherds 1, 2 & 3 Angel Gabriel, 3 kings, King Herod, star, (plus Santa, Rudolf, dancing angels, animals, guests in inns, extra shepherds etc as preferred). The italics are for optional characters. Don’t get carried away with the excitement of Christmas and forget the real reason for the celebration, Jesus being the very first and most precious gift of all. The Trinity, come from above. If you’re ready to buy the Grandpa’s Nativity Story, click on the ADD TO CART button below, or continue reading if you need more details. A “Grandpa’s Nativity Roll Call” performance poem: a fabulous and unique finale for your nativity play. Again, all in rhyme, this gives everyone involved the opportunity to take a bow as they say their own individual line. All variations are included to cover varying cast sizes and adaptations. The “Ultimate Christmas Gift” : A purpose written Christmas rhyming poem which can, if you choose, be read out to round up the message at the end of your nativity play, or even be extended for use in church as a sermon! 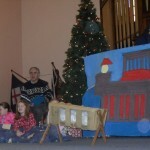 Grab your LICENCE FREE COPY of the Grandpa’s Nativity Story script at the ……. Still prefer The Grandpa’s Nativity Story? PPs. Still not sure? Click here and let the script previews speak for themselves. In the meantime why not TRY OUT MY WORK FOR FREE? Download your FREE COPY of my “Nativity Roll Call” rhyming poem which makes a fantastic finish to any traditional nativity play! Just enter your name and email address in the box below, click the “SEND IT NOW!” button and you will immediately be given the opportunity to download the Roll Call poem. Once you’ve seen how simple and instant the download process is, why not come back to purchase your instantly downloadable nativity play – you’ll be glad you did!